Christ the King School opened its doors in 1940 to 150 students. 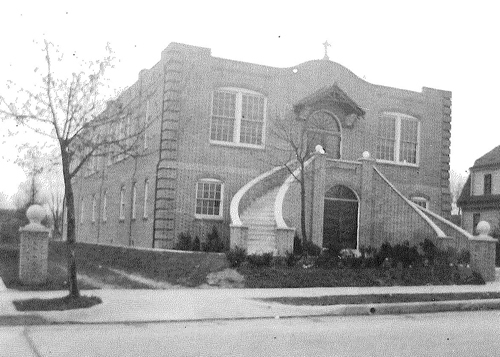 At that time the upper part of Christ the King Church was converted for classroom use and the Franciscan Sisters of Allegany, New York staffed the facility. Later that year, ground was broken for a new church across the street. In 1952 Christ the King School began to expand. A large gymnasium and cafeteria were built on the first floor. Above them a second floor with two additional classrooms, and a third floor with eight classrooms were added. In 1960 an additional building was built on parish property behind the school to house the school library, meetings, and religious education classes. In 1969 Christ the King School became a Regional School with its goal being " a sound, superior education within a Catholic environment." That year a regional school board was established. A memorial park was dedicated in 1975 to Monsignor Joseph B. McIntyre, first pastor of Christ the King Parish. This park is adjacent to the school and is still used today by faculty and students. The first lay principal was installed in 1986. Christ the King Regional School began its first school newspaper in 1989; today the newspaper is part of a Journalism class which has been incorporated into the curriculum as an extension of Language Arts. Also in 1989, the school received formal accreditation from the Diocesan Office of the Camden Diocese after a year and a half of self-study. The DARE program also began at Christ the King to educate students in drug awareness. The program continues to be a vital part of our fifth grade curriculum. In 1996 the faculty started their Middle States self-study. Christ the King Regional School received Middle States Accreditation in October of 1998. Capital improvements beginning in 1996 involved the installation of windows, a new boiler, roof, brick pointing, 2 fire-rated steel doors, and installation of new carpeting. In 1998 major renovations were completed to upgrade the fire alarm system and to provide a safe area for school buses for student drop-off and pick up. In the spring of 1999 the school's library, science lab and computer lab were evaluated and upgraded. In the fall of 1999 curriculum areas in Language Arts, Math, and World Language were reviewed. As a result new and challenging programs were implemented in the fall of 2000. The School Board, PTA and school Finance Advisory Committee are vital and energizing bodies that work in collaboration with the school administration and the faculty. We place strong emphasis on promoting a partnership between the home and the school. It is inspirational to see so many parents care passionately about our school. It is encouraging to see so many families support and utilize the Christian formation that characterizes our school. In the early 21st century, the school began another aggressive round of capital improvements. Since Y2K, the school, under the leadership of devoted parents, raised more than $200,000 that was ALL reinvested into the school. First, the field behind the former convent was completely renovated - including new fencing, new backstop, new sod, and installation of a state of the art irrigation system. Then the focus turned to technology, with more technology added in the junior high school wing. . The science lab was gutted and rebuilt. Running water, lab tables, connections for controlled gas experiments and multi media capabilities (more about that later) were all installed. All this along with new flooring, paint, etc. The renovation continued down the junior high hallway. With the exception of three rooms, the entire wing has been completely upgraded. The center piece of the renovation is complete multi-media capabilities in all classrooms. Each room is equipped with a SmartPanel line of wall mounted multi media distribution devices along with NEC projectors. This allows teachers to incorporate all forms of media into their education (world wide web, cable, DVD, VCR, etc). The science lab allows for a connection to the teacher's microscope, so the kids know what they are looking at in their microscopes. The students enrolled in Christ the King Regional School come from diverse ethnic and religious backgrounds. Children learn to appreciate not only the talents each other has to share but also what they can learn from other cultures. Instructional material is organized to accommodate the varied learning abilities of the student population. The faculty incorporates a broad range of teaching techniques to permit each student to attain academic success on an individual level. The students of Christ the King Regional School are encouraged to develop an appreciation of self, and are then urged to share with others by means of group experiences and intramural activities. The upper grade students provide examples for younger children and all students share the responsibility of the same value system. The current utilization of the school is 100%.